First Line: I followed the shrieks to the living room, but didn't rush. Clyde (short for Clytemnestra) Fortune, a police officer on leave from the Ann Arbor, Michigan, police department, is right not to rush. There are too many people in the room trying to deal with the situation as it is. Being back in the bosom of her family has its less desirable moments, and besides... she has dogs to walk. The Fortune family lives in Crystal Haven, Michigan-- a New Age sort of town where psychics, Tarot card readers, mediums, healers, etc. are all welcome to live and ply their trades. It's quite the tourist destination. Clyde has no intentions of fitting in, but when a local psychic is murdered, and the dead woman's traumatized dog winds up staying with them, Clyde can't help but get involved in the investigation. 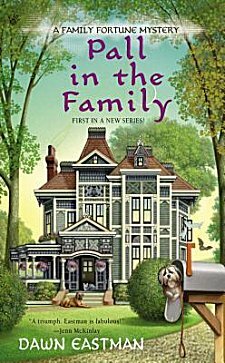 The big Victorian house was owned by Clyde's psychic grandmother, and now it is filled with Clyde's Tarot reading mother, her pet psychic aunt, her teenage nephew who's staying with them during his summer vacation, and Clyde's father, who's downright normal compared to the rest. The entire family believes that Clyde's psychic abilities are even better than her grandmother's, but Clyde has had years to perfect ignoring their existence. I can't say as I blame her, since what few visions she's had are of those-who-are-soon-to-be-dead variety. I've had a few of those myself, and if I never have another one, I will die happy. Pall in the Family is liberally sprinkled with laugh-out-loud humor, and although the investigation is slow to get off the ground, once all those family members buckle down and divvy up their self-imposed surveillance detail, the pace-- and the laughs-- pick up speed nicely. What shines the brightest in this book (besides the humor) is Eastman's sterling cast of characters. Clyde has a smart alecky sense of humor that always wins me over, a knowledge of how investigations should be conducted, and a few mysteries in her past that make readers want to ferret out the facts. Her teenage nephew is in effect her sidekick throughout the book, and he's the perfect blend of impulsive teenage boy, common sense, and empathy. Two of the characters vaguely reminded me of two of Janet Evanovich's: Aunt Vi with her attitude and wacky opinions would get along fine with Grandma Mazur, and Clyde's dad, who can usually be found hiding behind his newspaper and listening to his police scanner, could easily be best buddies with Stephanie Plum's father. But before you think this book is just an Evanovich clone, let me assure you that it's not. Oh, and did I mention that Clyde's old flame is a member of the Sheriff's Department? He is, and he adds just the right touch of romantic spark. One of the things that surprised me a bit was that-- for its setting and its characters, this book has very little paranormal goings-on, so anyone who can't deal with "woo-woo" should be able to read and enjoy Pall in the Family. All in all, this book is a very enjoyable read, and with its cast of characters in place, I'm looking forward to reading more of Clyde's adventures. Cathy - I'm already drawn to that Victorian house! They can be such great settings in a story. And I'm glad the characters 'did it' for you in this one. They sound terrific. I'm not a cover junkie, but I think it's one of the reasons why I bought the book!